Vegetarian Italian Risotto Recipes. Italian vegetable risotto recipes. Risotto is one of the most famous forms in which rice is used in Italian cooking. Italian rice used for risotto is a round, short-grained variety with a nutty flavour. Arborio rice is the very best kind to use. The rice is cooked in a stock with loads of herbs, garlic and onion. You can even add vegetables to it which would give a nice crunch to the dish. Vegetable risotto with colourful veggies makes it extremely appealing and also irresistible due to their aromatic flavours while being cooked. The Baked Vegetable Risotto is another cheesy, colorful and fun to eat Italian dish. Serve it with garlic bread or crostini to make a complete meal. One of my favorites is the creamy mushroom risotto. While I generally use button mushrooms, you can use any variety of mushroom that is available. Similarly, you can make pumpkin risotto or Sundried Tomato Risotto. If you do not have Arborio rice, then try making this Dalia risotto. Also, keep in mind risotto is best when freshly prepared and quickly eaten! 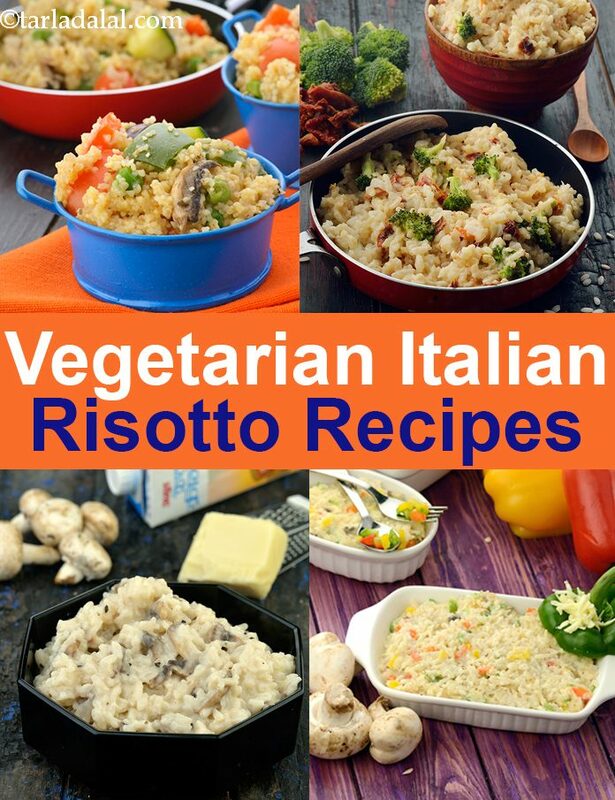 Enjoy our Vegetarian Italian Risotto Recipes. Italian vegetable risotto recipes and other Italian Recipe articles below. Vegetable risotto has colourful veggies in this dish makes them extremely appealing and also irresistible due to their aromatic flavours while being cooked. Vegetable risotto is a very easy and a delicious recipe. . . Actual risotto is made using arboria rice but you can also use basmati rice, it taste the same. . . This rice prepartion is cheesy, colorful and fun to eat. . Serve it with garlic bread. . The colourful veggies in this dish makes it extremely appealing and also irresistible due to their aromatic flavours while being cooked. To make the veg stock use all kinds of vegetables with some ginger and coriander leaves to get the flavour in your rissoto. 1. if you can't find leek you can use green onion instead. 2. always put stock little at a time, don't put all the stock at once because you might not need all.